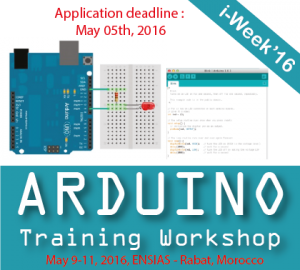 The organizers of i-Week’16 offer the opportunity to benefit for free from a 100% practical training workshop on embedded systems based on Arduino Platform. Arduino an open-source physical computing platform based on a simple micro-controller board, and a development environment for writing software for the board. It is a powerful and easy tool to develop interactive objects. This training will be dedicated to mastering software and hardware tools for the design, simulation and implementation of embedded electronic systems based on Arduino boards. Application deadline: May 5th, 2016. Notification of selected candidates: May 7th, 2016. Basic knowledge of C programming and electronics.